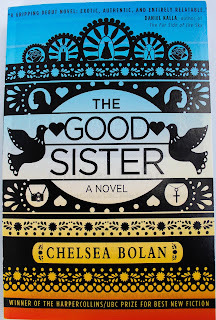 Thanks to the Harper Collins Canada First Look Program, I was lucky enough to get an advanced copy of THE GOOD SISTER, and whoa, what a cool premise! Along with a tight plot and engaging characters, Bolan's rich and vivid imagery exposes elements of Mexico that foreigners rarely have access to, so it’s easy to see why this book won the Harper Collins/UBC prize for best new fiction. Mostly because it's freaking fantastic! Not yet fifteen, Gabriela Amador Prieto has been cast out of the family home by her father, who believes her shameful behaviour has tarnished the family honour. All traces of her have been removed, and not even Lucy, Gabi’s older sister and best friend, knows where she is. Furious at her father and desperate to find her sister, Lucy leaves their small town in Baja California, Mexico, and sets out for the capital to track Gabriela down. While Lucy ventures deep into Mexico City’s most dangerous neighbourhoods, back at home her family members—her brothers, her mother and father, and her brother-in-law, Antonio—struggle with their own roles in Gabi’s banishment. 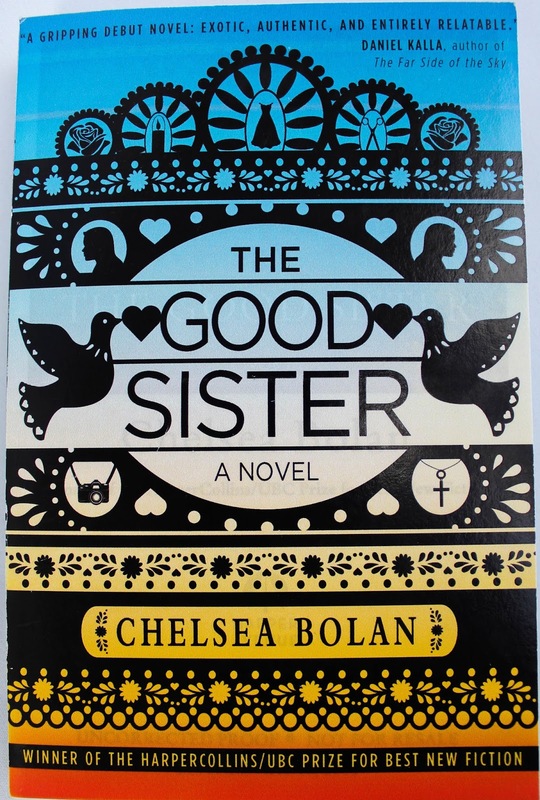 The Good Sister presents a vibrant, captivating portrayal of contemporary Mexico, and of a family torn apart by a father’s hypocrisy. Engaging and emotionally rich, this novel is a fascinating exploration of betrayal and steadfast devotion, and the ways in which our own intolerance can harm what—and whom—we love most. Juxtaposed against the typical tourist experience of drinking, dancing, and letting loose in Mexico, THE GOOD SISTER provides a captivating exploration into a culture I know little about. But at its heart, this book is about family, and how societal expectations can break apart even the closest relationships, which made for a heartbreaking and uplifting read. I enjoyed the multiple POVs, as each character was allowed at least a few chapters to express their opinions, which was necessary when it came to female characters. The writing was superb, and the insertion of Spanish phrases kept the voice consistent and authentic. I haven’t been to Baja California, and yet I feel as if I have. Gah, do I ever love when that happens! It’s just the best! Lucy’s determination was also impressive. Considering her circumstances, I’d expected her to be uncertain and tentative with her decisions, as she lived in fear of suffering the same fate as her sister, but once she made the decision to find Gabriela, she never wavered from her goal. Putting her own safety at risk to find her sister became second nature to Lucy, and my esteem for her grew tenfold. She simply did what she felt was right and wasn’t willing to stop until Gabriela was found. 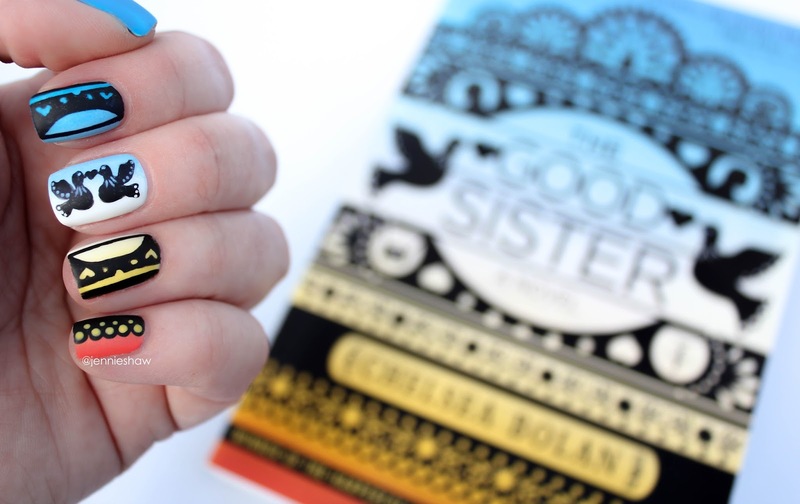 So if you’re into layered and insightful fiction, you’re definitely going to want to pick up THE GOOD SISTER! Plus, there's the cover. At first glance, it appears like a bunch of random images: a candle, a dress, a cross on a necklace, but each one has a deep meaning, which you’ll only learn about when you read the book. How freaking cool is that? *sighs happily* Haha! THE GOOD SISTER came out on Tuesday, you should definitely add this one to your TBR list. Like, now-ish. Thanks again to Harper Collins Canada! 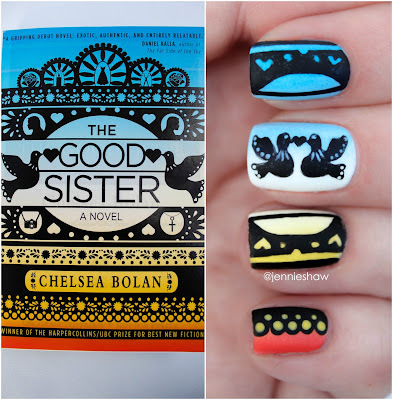 I loved my first look at THE GOOD SISTER! Your nails look amazing. Have a great week. I am a nail polish nut, too, and I've looked over your previous, awesome posts - glad to find your blog. I have to say I love this manicure the most! The color gradient you achieved is just stunning and matches the tone of the cover perfectly! The black details are so clean and precise! In short, I'm jealous and wish I had your skills. I'm more of a skittles or glitter gradient person, but I might give this a try.